Although Schwarzman has a history of over-the-top self-adulation (i.e., he spent $3 million dollars for his 60th birthday party, transforming the giant Park Avenue Armory into a replica of his 35-room Park Avenue palace in the sky, down to the replica paintings, and buying himself serenades from Patti LaBelle and Rod Stewart), he is undoubtedly not the only hedge fund manager or trader who continues to believe they are a special, privileged class that deserves few or no taxes on their income. Again, I’m reminded of France during the Early Modern Era in which the aristocracy paid no taxes while at the same time receiving tax-free subsidies from the Crown. In order for the Crown to finance its upkeep and that of the nobility and its’ many wars, the non-noble classes paid all taxes: merchants, artisans, sharecropping farmers, and peasants. In return for not engaging in commerce and being both loyal to and on call by the Crown, French nobility received a tax free subsidy from the Crown on which to live, plus the nobility were allowed to govern and tax the people living within the boundaries of their land holdings at whatever rate they chose. All in all, the French nobility lived quite well and yet they constantly sought more favors and dispensations from the Crown to increase their income, their wealth, and their holdings. For more than a century, the Crown staved off the anger of the masses with nationalistic proclamations and wars, wars of religion, and by brute force. Yet, in the end, it was this attitude of special privilege, during the worst of economic times, that culminated in the French Revolution. As I mentioned in Part 1 of this essay, during the decades leading up to the French Revolution, France’s agrarian culture suffered extreme environmental disasters as a result of harsh weather conditions. Grain crops, which were mostly wheat and barley, drowned in the fields due to excessive rain that turned fields into muddy swaps or seeds that froze before sprouting due to excessively cold, long winters. The aristocracy and Crown only made economic matters worse for the people through speculation, exporting whatever grain existed as well as wine and grapes at exorbitant prices. Meanwhile in England, which also suffered from the same weather related disasters, women took to the streets and revolted against speculation-driven grain exports. After a major women-led revolt at the eastern harbors, the English King, James I, prohibited any further grain exports. But not the French. The French Crown and aristocracy refused to acknowledge the plight of their people, and thus set themselves up for an extraordinarily bloody Revolution that shocked and dismayed even the revolutionary-minded Thomas Jefferson. I submit that average people don’t mind a disparity of wealth, but they become angry to revolution when they see themselves as the only losers – pawns if you will – during economically harsh times. The American people expect equality of suffering as well as a reasonable share in wealth growth during good times. They expect a sense that “everyone is in this together,” and that no class is walled off and protected because of their influence and political power while everyone else is paying the bill. That has been part and parcel of the social pact since the very beginnings of the country, back in the early 1620s. It’s unfortunate that Schwarzman and his colleagues on Wall Street – as well as their Congressional and K St enablers – don’t understand this economic dynamic. As Randall Lane writes in his book, The Zeroes: My Misadventures in the Decade Wall Street Went Insane, the same people who caused the horrific meltdown of the economy now excoriate President Obama as being “anti-business” because he proposes to have them help pay at slightly increased yet less than normal earned income tax rates for the increased deficits they caused. 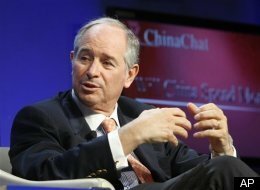 Schwarzman, and his compatriots, are once again saying, “Let them eat cake” to the rest of the wage earning and tax paying American public. The correlations to Early Modern France are to stark to ignore. I’m wondering is how long will it take for the rest of the American public stop being diverted by wedge issues and fighting amongst themselves to realize how badly they’re been manipulated by a Wall Street agenda that expects them to pick up the deficit tax tab that Wall St created? Will it take another extraordinarily bloody French Revolution or will Americans revert to the bloody revolutionary spirit that existed prior to and during the administration of Teddy Roosevelt which gave rise to unions after the deaths of thousands of American workers…as well as TR’s hard fought worker protections?